The zucchini’s summertime reputation suffers because of its hearty propensity to multiply. People begin talking about ‘what to do with them all’ in an aggrieved tone noticeably lacking in appreciation for the good vegetable’s many virtues. Gardeners offer zucchini to friends with an apologetic smile, like supplicants attempting to rid themselves of so many stray and unwanted kittens. 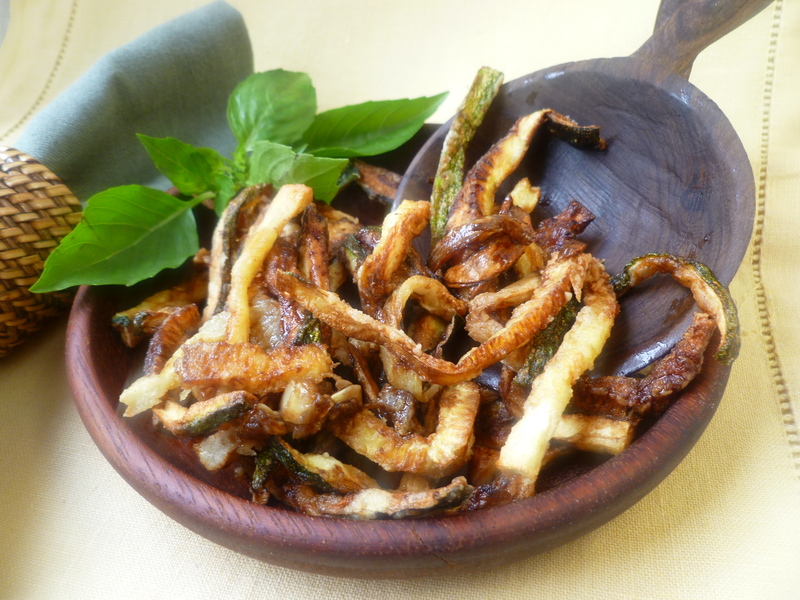 Fried Zucchini in Vinegar and Garlic is not, however, a way to ‘dispense’ with this summer’s bumper crop. It is a reason to be glad that this fine green plant is fruitful and multiplies with enthusiasm, for one may turn those fruits into this simple and excellent preparation at the drop of a hat, when the vegetable is at its freshest and tastiest. And when you have served it several times as a side dish, you can turn around and have it again…on a bed of greens as a salad. Timing Note: This dish is served at room temperature and so, despite the fact that the zucchini are fried, they need not be prepared at the last moment, just before serving. Olive Oil: Enough to float the zucchini sticks as they fry…The amount will depend on the size of the pan. 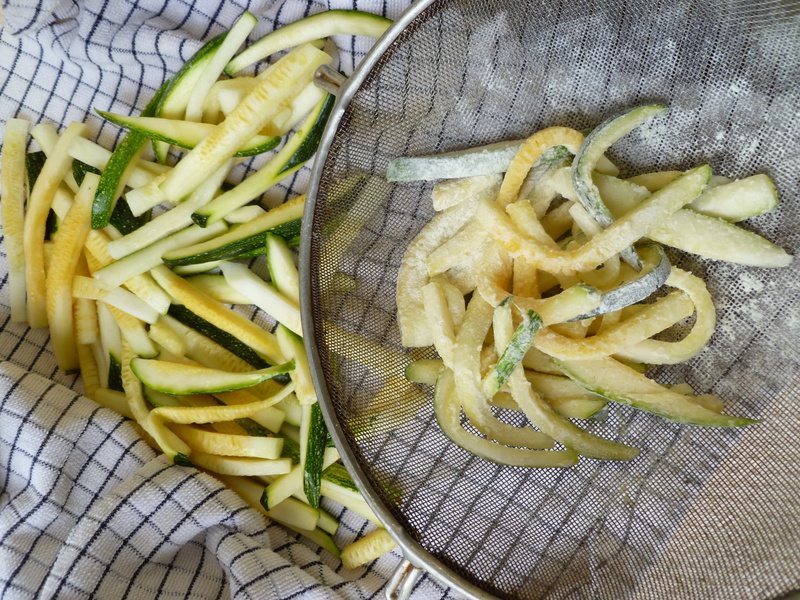 Using a smaller pan requires less oil and a longer time to fry the zucchini since they should not be crowded in the pan. Optional: Small stems of fresh Basil make a pretty garnish for each serving. 1. Soak the whole zucchini in a bowl of ice water for 20 minutes. Drain them and cut them into sticks of about a 1/4-inch thickness. Place the sticks in the colander, sprinkle them with salt and set them in the sink or over a bowl to drain for 30 minutes. 2. Pat the zucchini sticks dry. Put some of the sticks in the strainer and pour a Tablespoon or so of flour over them. Shake off the excess. 3. Pour enough oil into the pan so that the zucchini will float as they fry. Heat the oil over medium heat until it begins to shimmer. Set the paper towel-lined baking sheet nearby. 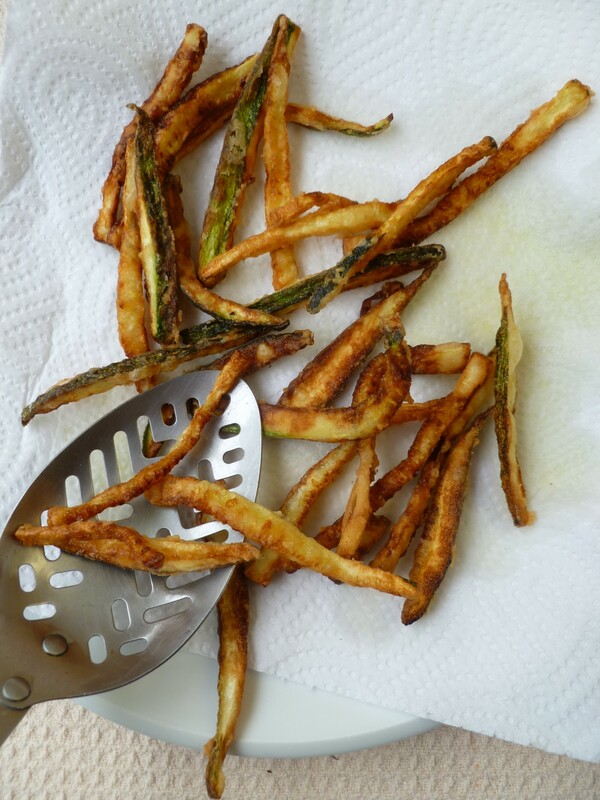 Add some of the floured zucchini sticks–without overcrowding them in the pan–and brown them all over. 5. 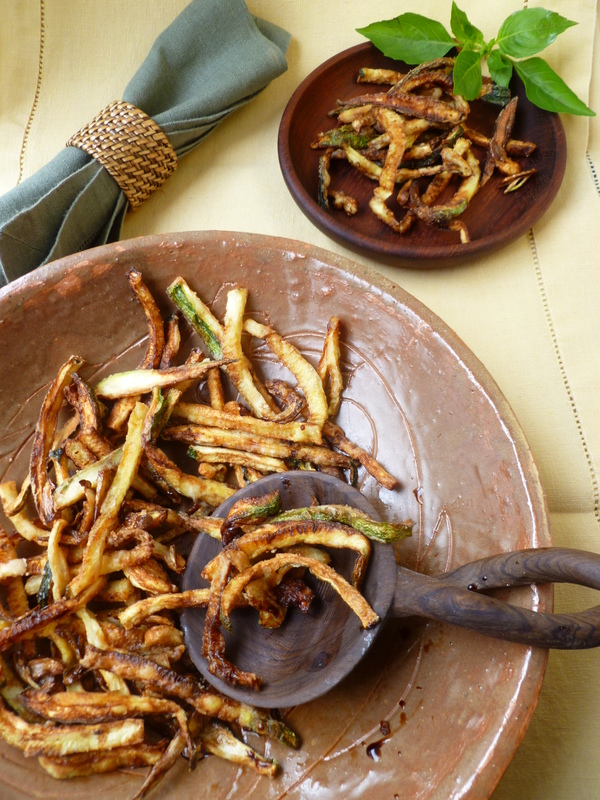 When all the zucchini has been fried, brown the sliced garlic in the oil and transfer it to the serving bowl, too, burying the slices down into the midst of the zucchini. 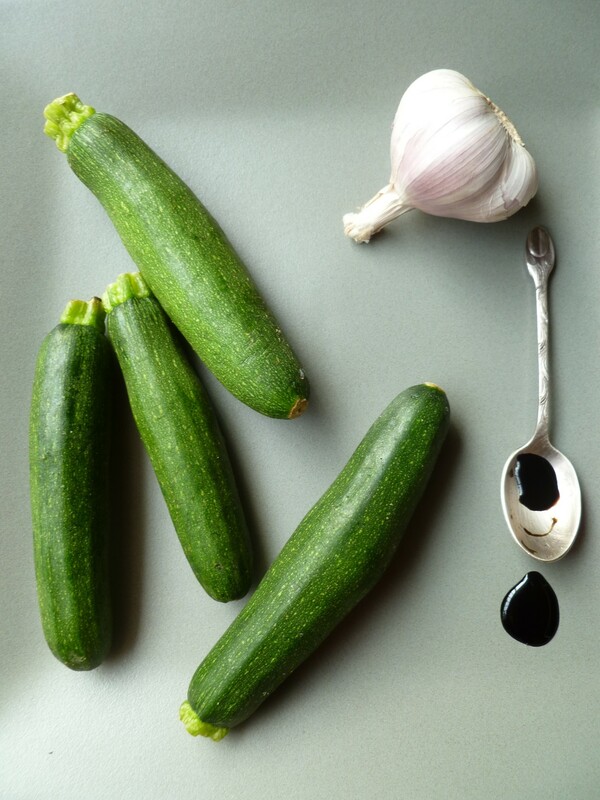 Drizzle 2 Tablespoons of vinegar over the zucchini and grind some black pepper and salt over it. Toss well. Wait for about 5 minutes and taste. Add another Tablespoon of vinegar if a stronger flavour is to your liking…and additional salt and pepper if you see fit. 6. Cool the zucchini to room temperature before serving. Add small stems of fresh basil to individual servings just before serving if you like. A Note: This dish is served alongside the Main Course of Beef Tenderloin Stracotto Style in the Dinner Menu: Surf and Turf Chez Laeuchli. It is, alternatively, a very nice and different salad, served on a bed of greens. 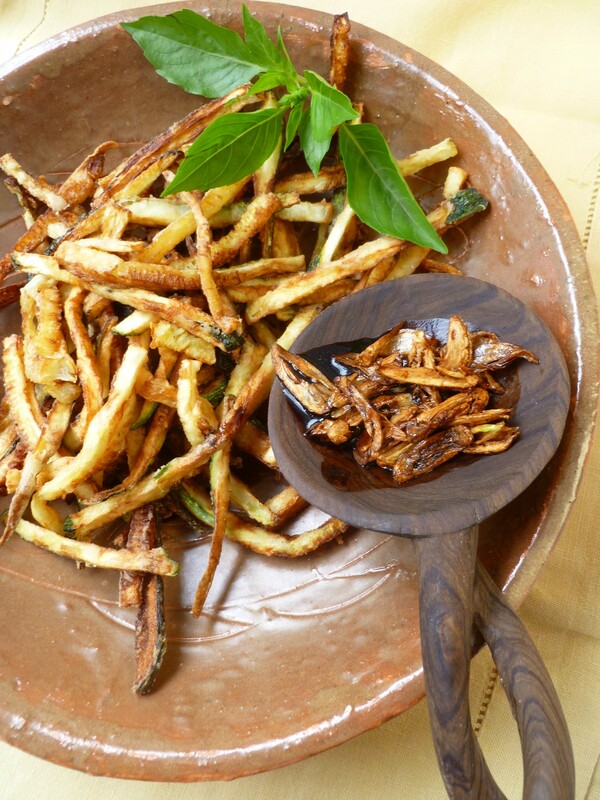 An Acknowledgement: Fried Zucchini in Vinegar and Garlic is adapted from a recipe in Marcella Hazan’s Essentials of Classic Italian Cooking (1992).